I had the repair kit out last night to super-glue the sole of James’s trainers. On our last US road trip we had to buy new walking boots as he left his in the car during a heatwave and the rubber soles disintegrated a few days before we were due to hike in the Grand Canyon. Nothing so drastic today as it was a scheduled non-driving day in Denver. Our only previous trip to the city does not really count as it was only a slightly longer stop on the California Zephyr’s route called a ‘smoke stop’ which allows enough time to stand on the platform for a few minutes. There was no need today for an early rise and we wandered slowly downtown. It was already getting hot. The pedestrianised part of 16th Avenue has three painted pianos in the middle all being played by someone and there were several other buskers. 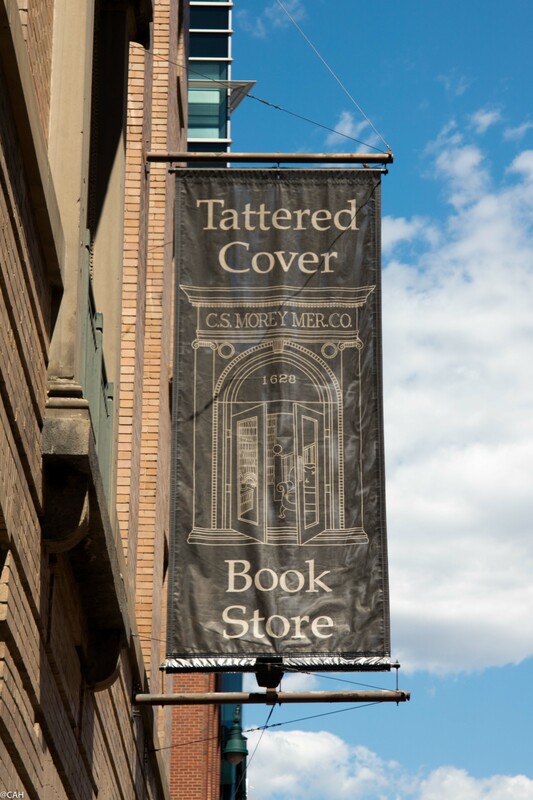 I had to explore the Tattered Cover Book Store which also has a café and could have come away with a pile of books but restricted myself to one. I have read most of William Least Heat Moon’s books (many bought in the USA) and did not have his latest published last year, so that was my purchase today. On a previous trip to the Pacific North West I had bought so many books that my case was overweight and I had to repack into hand luggage and James’s bags at Vancouver airport. James had seen an antique map in the bookshop and sure enough there is an antique map seller not far away. We had a good conversation with the proprietor, inevitably about politics and Brexit which was more interesting now that we have left the Trump heartlands. We came away having bought one small map of the Gulf Stream dating from 1840. Near to the station, I thought I could hear some gospel music and realised that a small choir were singing. However, they were on their last number by the time we got over there. 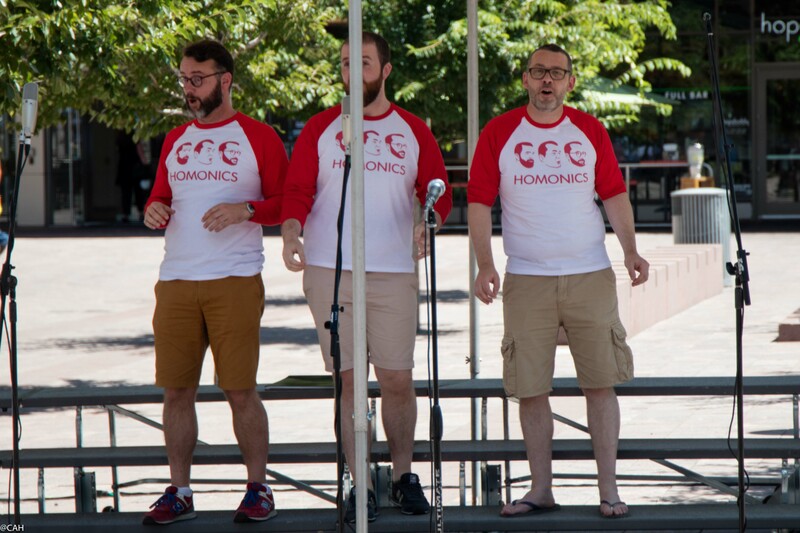 On the way back from the map shop we had just missed the European Queer Chorus who were leaving the stage but enjoyed this trio: The Homonics (who hail from Dublin). I discovered that the biggest LGBT Choirs festival in the world, GALA Festival is currently happening in Denver with approximately 6000 singers here. I chatted to some of the Queer European Chorus members who were from the UK, Germany and Sweden. We certainly do not have this next to Crewe Station at home. Over the railway is Riverside Park and we sat for a while in the shade as by then it was 95 degrees. 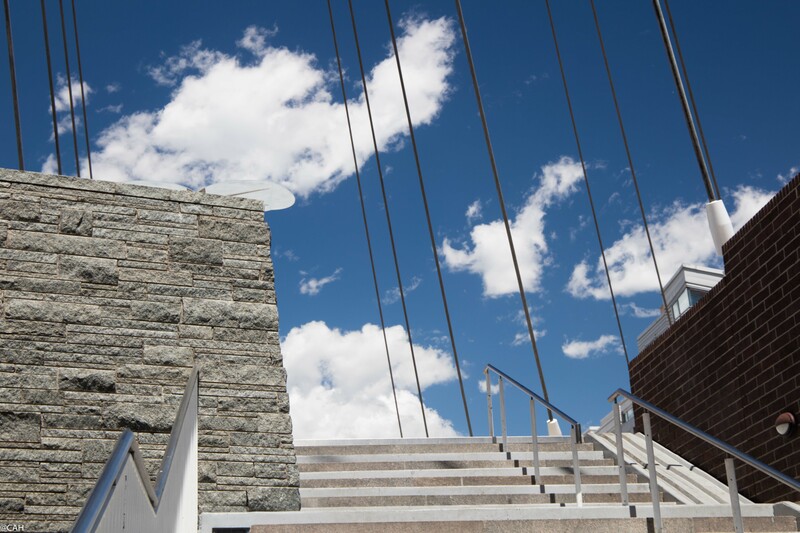 It was then time to visit the Colorado Contemporary Art Museum which does not open until noon. We got in for free as one of the galleries was being re-hung. The artists represented were Guido Ignatti from Argentina who works in several media, his works inviting a new look at everyday objects and Molly Bounds, a local painter. We had lunch in their rooftop café. On the way back to our hotel for a siesta, we passed a cosmetic dentistry clinic where the patients/customers have their treatment right in the front window in full view of all the passers-by which would not be my choice. We also discovered that the local traffic wardens get round on Segways. There are a many street installations and examples of street art in Denver but we only saw a few during our one day here. Throughout the day we kept getting glimpses of the golden dome of the Capitol glowing in the sun and the trainers held out for more than seven miles on our ‘lazy’ day.